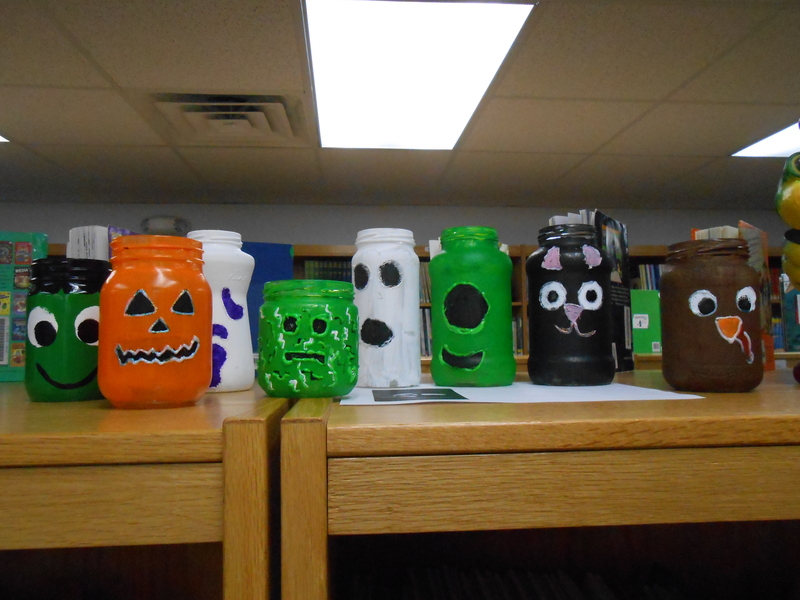 This is the third year we have the fun of having the Festival of Trees here at the library. This is a fund raiser for the Friends of the Library and it may be as anticipated as much as the book/bake sale. Various businesses and individuals make up trees to display at the library. Next to every tree is a canister where you can drop in some quarters (or any money amount) to vote for your favorite tree. At the end of the Festival of Trees (after Christmas) the Friends of the Library count up how much each tree earned and the winners are then given gift cards of some kind. It is a great way to showcase your business. The creativity of each tree is always such a fun thing to see. Be sure to stop in and look over the amazing detail of each tree and don’t forget to vote for your favorite tree! You can see all the trees and who they belong to in this facebook album. Here is a sampling of the the trees we have here today in no particular order. 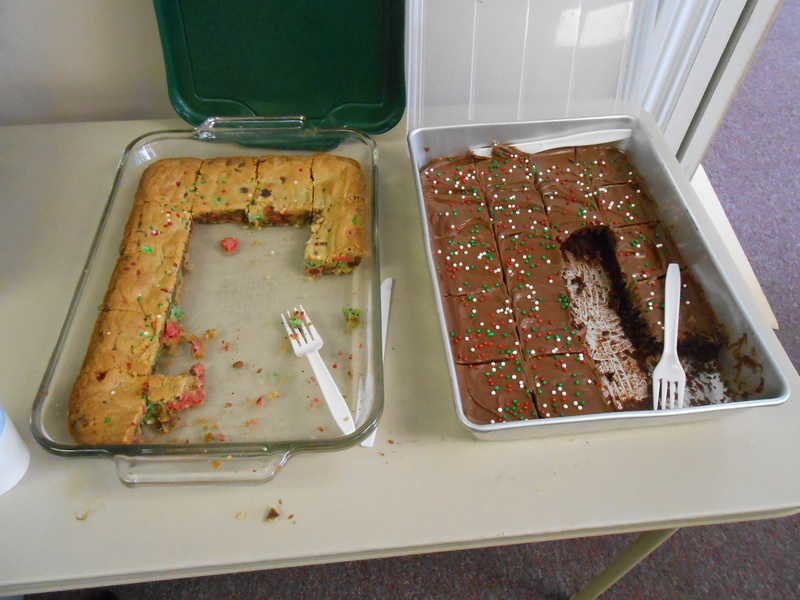 On Monday, December 14 the teens gathered at the library for our annual Christmas party. We like to spoil our Teen Council at Christmas in the form of food, because every teen seems to like to eat (a lot) and Alicia had a meat/cheese/cracker platters set up for them as well as a hot cocoa station. After the Library Crash in April following a Teen Council meeting, this front room has been completely in disrepair or under construction. This was the first time any of us had used the front room for anything at all. Alicia worked hard to make sure the floors were mopped and the room ready for the teens party. We started the afternoon off with snacks and cocoa before beginning our first game. The teens played this last year and it was so fun we had to try it again. Two boys volunteered to be “snowmen” and then chose their teams to decorate them. Each team was given four toilet paper rolls, tape, scissors and construction paper to make any snowman they thought would win in a 15 minute time span. Due to basketball and a rather icky flu bug going around, fourth grader Abe volunteered to be a snowman. We told him he couldn’t talk when the toilet paper went around his mouth. It was the longest we have ever heard him be quiet! Some teens arrived a little later and jumped into teams according to who needed the extra helper. Miss Denise ran back and forth getting photos of the snowmen in progress but not giving away any hints over who was doing a better job. It’s so much fun to see the different teams creativity using the same materials for each snowman. Each team was VERY particular about the other team not even getting so much as a glimpse of the other team. Team A was done first and posed for a photo before time was called. The funniest thing about this for the snowmen is that they can’t see thanks to their eyes being covered in toilet paper so they have no idea how they look. Team H worked until the very last moment. Miss Nan was called upon to judge between the two snowmen for a winner. There was a lot of giggling as we waited for the final word to be said. Miss Nan chose Team H for the winning snowman. Team A wandered blindly into the front room and was placed next to Team H for a photo of the snowmen side by side. As soon as they were given the okay, the boys tore out of the toilet paper. Who knew toilet paper worked to keep one so warm? There was a lot of laughter and Abe immediately began telling everyone the play by play of the process becoming a snowman. No one was very thrilled at the idea that Miss Denise was taking their picture. It’s hard not to look a bit silly with a plate being held on your head. The teens were given instructions of what to draw – a Christmas tree, a fire place, a mantel, a present under the tree – and when the last instruction was given, points were added up according to how they did following the instructions. The winner was given chocolate and showed off her masterpiece. It was funny to watch their concentration of drawing and how messed up their drawing really was. After all that fun, it was time to eat again so Miss Denise pulled out some home made Christmas cookies and the teens decorated them with frosting and sprinkles before gobbling them up. It was a VERY fun Teen Council and it was a great way to use the front room for the first time since April. We may not have Christmas Snow this year (the temps were mild and we had rain!) but we sure felt some Christmas joy that day. October went by really fast for us and so this is our first and only new book update for the month. I would love to show you all the books but in all honesty I have spent the entire day working on html code and would have to do a lot of that here and I just don’t have the patience. So I give you this link.. Here you can see all the new books and if you click any of those books (please oh please let all the links work!) you can see them on OUR LIBRARY WEBSITE – woohoo! – and reserve any of the books you would like. It’s an amazing service we have now. You can write book reviews there too, if you are so inclined. Again, you can always learn what new books we have if you follow us on Goodreads because we “want to read” all the new books we get in. Trick or Treating traditionally begins at 4:40 pm and is done by 7:30 pm You are invited to attend the Fire Department’s Open House from 5 to 7:30 that same evening for free hot dogs, brats, and many other treats. The Martin UMC and The Rock @ 5 0’Clock are hosting “Trunk or Treat” from 5 until 7:30 pm Participants are invited to decorate their car trunk and pass out treats. Cars are to locate in the church parking lot. Please register at the church office at 672-7097. We will be closed on November 27th, Thursday (as we usually are), Thanksgiving Day. We will also be closed that Friday (the 28th) and Saturday (the 29th) so the staff here at the library can have some Family Time. 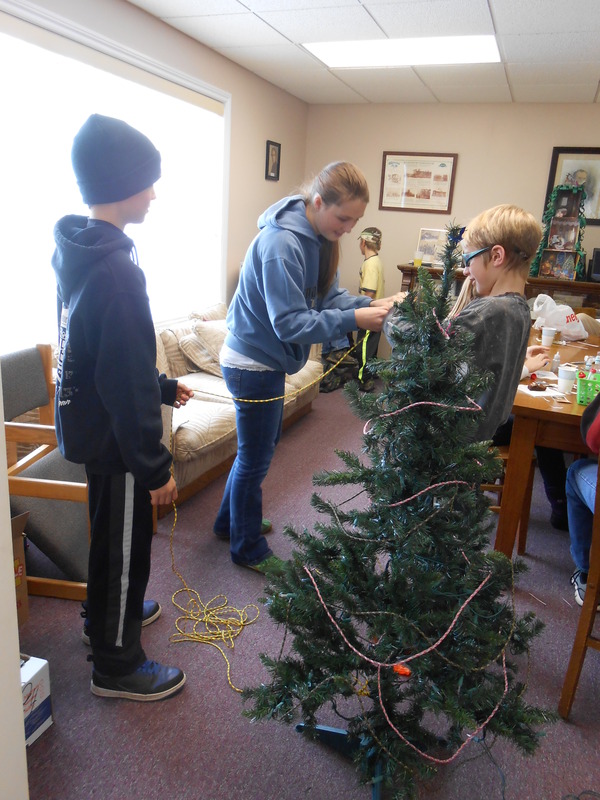 On Monday, November 17th the Teen Council met at the library to put together a Christmas Tree for the Festival of Trees here at the library. The Festival of Trees is put on by the Friends of the Library. 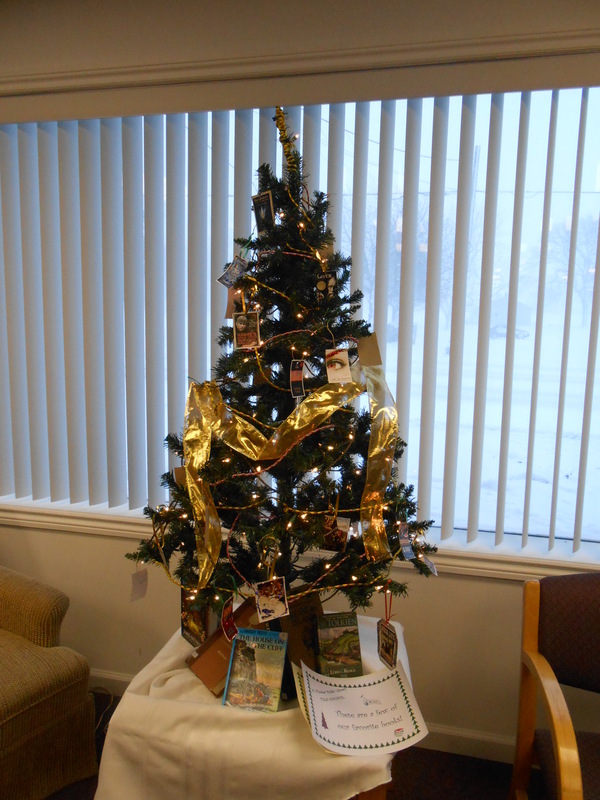 Various businesses and organizations decorate a tree to be displayed at the library. People come in and vote – with a quarter – for their favorite tree. The tree with the most money wins! All money goes right back to the library. Miss Alicia sent out an email asking the teens for some of their favorite books. While the teens are great at sending in football picks (if you want to know more about that, be sure to email us and ask. Weekly football picks are great fun! ), they fell a little short on their favorite books. No worries, they thought of plenty when they arrived at the library. 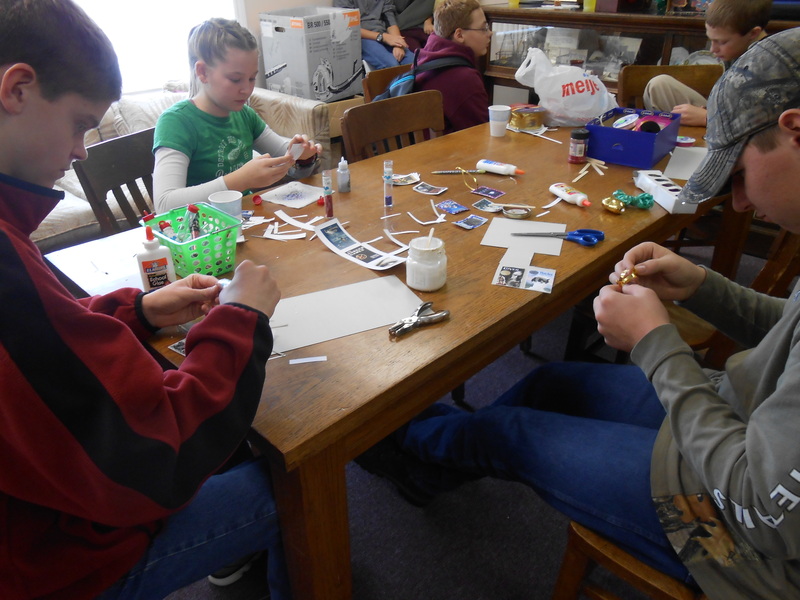 and sipping hot chocolate or gulping various soda, the teens got to work. 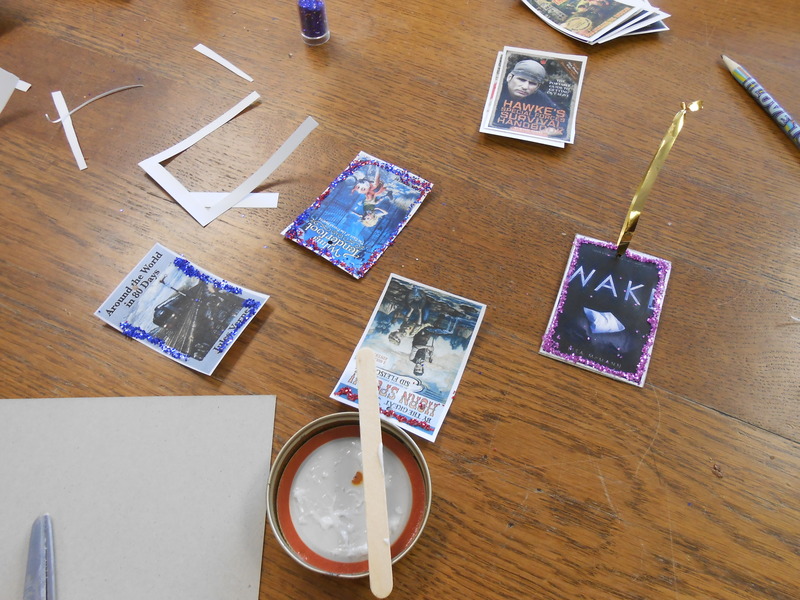 They formed an assembly line of sorts to cut out, glue and glitter the copied book covers. Samuel worked on making the Golden M to showcase on the tree. They also streamed para-cord, still a favorite craft, around the tree as well. The tree is prominently displayed in the front window. Get your friends down to vote, teens! You have some pretty tough competition! Our small town gets all decked out for Halloween! Halloween night, come into Martin between 5-7 for dinner provided by the awesome Martin Fire Department and then enjoy walking the streets of Martin with your children for trick or treating at all the decorated homes. Trunk or Treating will also be happening at the Methodist church in town from 5-7pm. Even without having little ones heading out to trick or treat, it’s still fun to watch all the fun that evening. Dinner at the Fire Barn is free with donations encouraged.